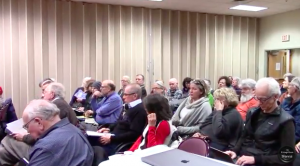 VIDEO: 2/22/18 Public Scoping Meeting – Proposed Lincoln Park Gas-Fired Power Plant in the Town of Ulster. 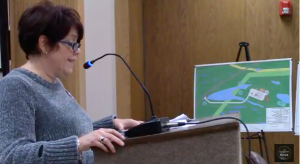 There was a full house on Thursday night of concerned citizens giving testimony to improve the Draft Scope of the proposed Lincoln Park Grid Support Center, a gas-fired power plant in the Town of Ulster. Citizens will have the opportunity to work together with experts and draft strong comments of concern for study for the project to submit to the Town Board and applicant before the March 22nd deadline. A full list of experts who will be on hand that day to be announced. On air quality and noise. On community character, community services and cultural Resources. On water (surface, ground and wetlands), storm water and waste water. Please join us. Food will available all day. This event is open to all citizens, NFP and municipal leaders wanting to contribute. Air quality and seniors with compromised breathing issues. Alternative analysis, Visual Analysis, Climate Change and GHG Emissions, Other Air Emissions, Fiscal Impact, Cumulative Impacts, Threatened/Endangered Species, Project Purpose and Energy Benefits, Compliance with Zoning. 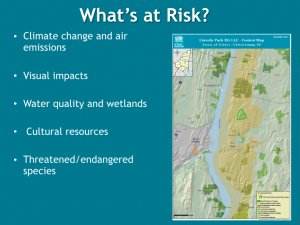 Concerns of project/precedent setting for Ulster County. Availability of alternative sites to include alternative sites, not just for proposed project but an all battery alternative. What other sites might be possible? Table proposal until NYS has updated battery storage regs. Possibility of viable alternative and economic feasibility of project. Emissions, home values. How can Town Board represent its constituents as Lead Agency? Potential impacts from EMF (Electro Magnetic Field), Financial impact on home values and accountability to the residents, Town Board to host a meeting to share the financial benefits from GlidePath….since this apparently such a lucrative project, so much so that someone from Chicago is coming to the Town of Ulster to create it, can the Town of Ulster make a renewable project in a different location and profit instead? Partial use in sync with Town of Ulster Comprehensive Plan? In the application, it requests being run 24/7 even though it’s a Peaker project. How many days do they plan to really run? Lights on all night? Concern for nocturnal animals. Why would we want to continue to support fracked gas that would cause harm in other parts of the country when in our state, we have banned fracking? 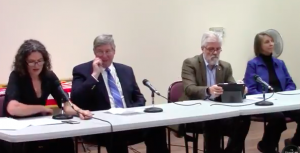 VIDEO: Town of Ulster Supervisor James Quigley Appears to Deny 90 Days Public Comment in Scoping. 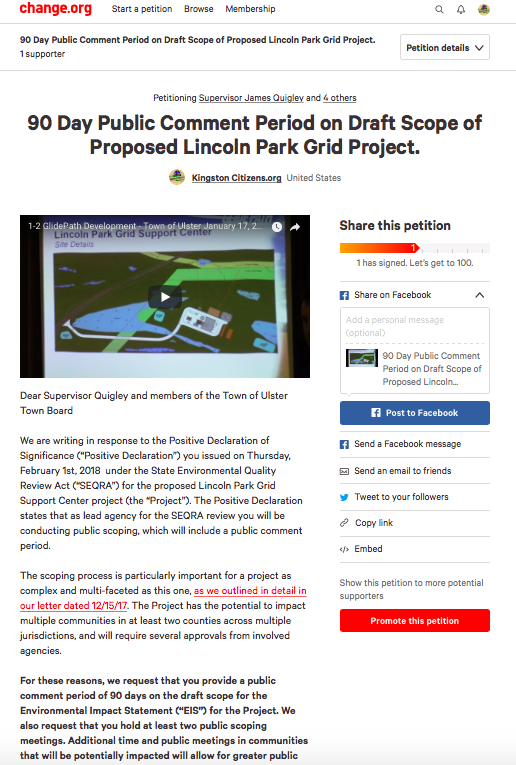 At last night’s Town of Ulster Town Board meeting, Town of Ulster citizens made a consistent request of their Town Board (who is Lead Agency in SEQR for the proposed Lincoln Park Grid Support Center, a gas-fired power plant project in the Town of Ulster) for a 90 day public comment period during the Scoping process. “No, no, no, no. I asked a question. How many people want the town to comply with the SEQR law?” asked Supervisor Quigley. “What does that mean?” said citizens. “Well you should have done your homework before you asked for 90 days!” he snipped. “Fine with me.” said Supervisor Quigley. “I guess the answer is no for the extension.” said a citizen as he exited the room. That appears to be the case. We’ll see. “15 seconds…” said Town of Ulster Town Board member John Morrow. “You can read the rest, unless I am granted the opportunity…” said citizen Neeson. Additional time was granted by Town Board Member Eric Kitchen. “How long before the citizens will know if you’re going to grant us the 90 days? The Town of Ulster will host a public scoping meeting on Thursday, February 22nd at 7:00pm at Town Hall. GlidePath was stated to be present by Town Board members at the recent Scoping educational panel. Citizens from around the county are invited to (and should) attend. On Tuesday, February 13, Citizens for Local Power hosted an excellent public educational forum “Battery Storage, Climate and the Grid: The Proposed Lincoln Park Project n Context”. With a proposal on the table to build a power plant in the Town of Ulster that combines a 20-megawatt gas-fired plant with battery storage, the group brought together a panel of experts that included: Jen Metzger, Director, Citizens for Local Power (moderator) Energy Storage 101: What We All Need to Know with Dr. William Acker Executive Director, New York Battery and Storage Technology Consortium (NY-BEST); Karl Rabago, Executive Director, Pace Energy & Climate Center and Co-Director of the Northeast Solar Energy Market Coalition and, Emissions Impacts of the Proposed Lincoln Park Project with Evelyn Wright, Energy Economist, Sustainable Energy Economics, and member of Citizens for Local Power. Because Evelyn Wright’s presentation spoke directly to the Lincoln Park project emissions impact, we will start here and extract some of the key points that she made that is new information to us and important for our community to have. TOTAL YEARLY EMISSIONS OF LINCOLN PARK PROJECT EQUAL TO ALL HOUSEHOLDS IN THE TOWN OF ULSTER OR 1.5% OF ALL OF ULSTER COUNTY’S EMISSIONS. 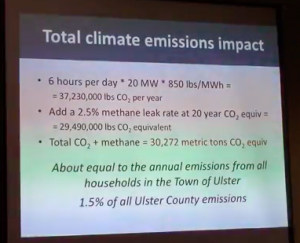 The total emissions for the Lincoln Park project during the course of the year is 30,272 metric tons CO2 equivalent, about equal to the annual emissions from all households in the Town of Ulster, or 1.5% of all Ulster County emissions. Click on IMAGE to download powerpoint. On Friday, February 9th Environmental Advocacy Director Hayley Carlock and Land Use Advocacy Director Jeffrey Anzevino of Scenic Hudson joined close to 50 Town of Ulster residents and two Town Board Members (Morrow and Secreto) to discuss the Lincoln Park Grid Support Center’s SEQRA process and why public participation in developing the scope for the environmental impact statement is important. Presented by Scenic Hudson. Sponsored by KingstonCitizens.org in partnership with CAPP-NY, Catskill Mountainkeeper, Riverkeeper and the Woodstock Land Conservancy. Thanks to The Kingston News for filming this event, brought to you by KingstonCitizens.org. 2. THURSDAY, FEBRUARY 15th at 7pm: Town of Ulster Town Board Meeting. Citizens should request for a longer public comment period in the Scoping process. 4. THURSDAY, MARCH 22nd. Deadline for written comments. 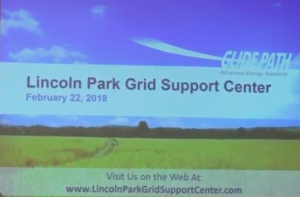 Last night (2/1), the Town of Ulster (ToU) Town Board added a late entry to their Town Board Workshop Meeting regarding the Lincoln Park Grid Support Center, a gas-fired power plant being proposed in the ToU. As Lead Agency, the Town Board presented and passed a resolution for a Positive Declaration (pos dec) determination in SEQR, as well as proposed a public scoping session on Thursday, February 22, 2018 at 7:00pm at Town of Ulster Town Hall. ToU citizen Laura Hartman attended the meeting last evening with several other concerned citizens. During public comment, Hartman graciously thanked the board for making a positive declaration for the proposal. Our coalition of partners (that includes CAPP-NY, Catskill Mountainkeeper, KingstonCitizens.org, Riverkeeper, Scenic Hudson and Woodstock Land Conservancy) has been waiting for a pos dec determination. In preparation, we created a letter that was ready to submit first thing this morning to Supervisor Quigley and the ToU Town Board requesting a 90 day public comment period with at least two public scoping meetings given the magnitude of the proposal. A LITTLE INSIDE BASEBALL. Connecting the dots. A pos dec and public scoping process is a great step for our communities and county. However, the ToU Town Board has already scheduled a public scoping meeting to occur on February 22nd without releasing the draft scoping document. A draft scope is submitted to the Lead Agency (and in this case, the Town of Ulster) by the applicant (GlidePath via Chasen & Company, their consultant) to release to the public. I like to think of a draft scope document as a ‘table of contents’. Typically, a 30 day window occurs for the public to review the document so to be sure that all items of concern for study are included. There is no one better to do this work than the citizens who live within proximity to the project with the support of the environmental advocates who have dedicated their life’s work to the protection of the area. All of these items end up in the scoping document and will require the applicant to pay for consultants to do the required studies. This will be a costly process for GlidePath. Given the public’s disdain for the proposal, it will be interesting to see how far they go as a true indication of it’s profitability. The ToU Town Board has already set the public scoping meeting to be 2/22 according to their agenda item without the release of the draft scope. This is problematic and indicates that they intend to release it sometime between now and the 22nd, banking on a 30 day window. This would leave the public with limited time to review and ask questions for a proposal of great magnitude. As far as I know, this is the first peaker gas plant being proposed in Ulster County. 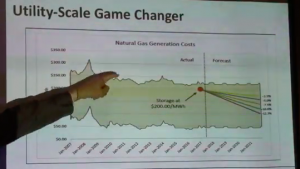 The project plans to re-connect new gas infrastructure at a time that citizens living in Ulster County and New York State have expressed their intention to segue from fossil fuels to renewables. A natural gas peaker power plant created by a company from the Midwest most certainly doesn’t do that. DAILY FREEMAN: Ulster Town Board Members Declare Proposed Electric Generating Plant May Harm Environment. KINGSTON TIMES: Ulster Power Plant People Get an Earful at Forum.